It seems so long ago that British Airways were offering £44 flights from London to Paris (see 7 July 2007 survey). The good news this week is that British Airways flight BA0324, leaving London Heathrow (LHR) at 1900 and landing in Paris Charles de Gaulle (CDG) at 2115, is the cheapest flight in this survey (of flights on the 12th October, flying from London to Paris between 1700 and 2000). The bad news is that the British Airways flight costs £89.80. 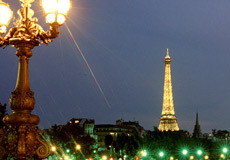 The cheapest flight from London to Paris, in all our surveys, is £44 (a British Airways flight). If you always chose the cheapest flight, the highest price you'd pay would be in today's survey of flights on the 12th October 2007 (£89.80). What's interesting about the above survey is that on 6 occasions British Airways flights have been cheapest and on 6 occasions easyJet flights have been cheapest. One would have thought that easyJet, being a low cost carrier, would be cheaper than British Airways, but this is just as much the case as it isn't.